A professor of cryptology has auctioned off a rare and fully-functional Enigma machine used by the Nazis to encrypt messages during the Second World War. Incredibly, the collector found the machine at a flea market in Bucharest—which suggests Romania may house other machines still waiting to be discovered. As reported in Deutsche Welle, the unnamed collector knew what he had stumbled upon at the flea market, and cooly snatched it up for €100 (£88). He then put it up for sale at the city’s Artmark auction house with a starting bid of €9,000 (£7,937). 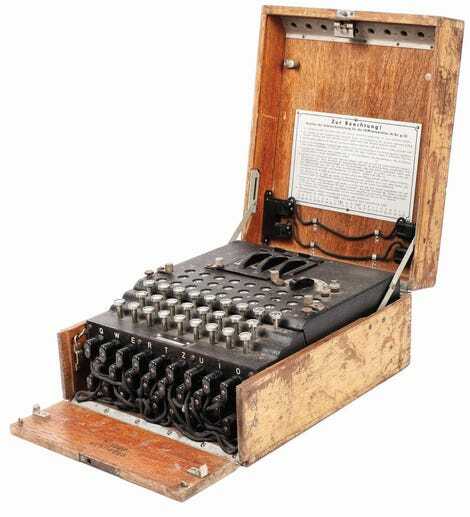 On Tuesday, the rare cryptographic machine sold to an unnamed online bidder for €45,000 (£39,688). A very healthy return on investment, to be sure. Enigma machines were invented by the Germans in the 1930s and were used by its armed forces to transmit encrypted messages during the Second World War. Romania was allied to Nazi Germany at the time, so it makes sense that the unit was found in the Balkan country. Famously, the breaking of the Enigma system by computer scientist Alan Turing at Bletchley park (with prior help from Polish spies and scientists) contributed to the defeat of Nazi Germany in WWII. The unit which sold on Tuesday is in pristine condition and it’s still useable. An Enigma 1, it was produced in Berlin by Heimsoeth & Rinke in 1941, and it’s still in the original wooden box. Around 20,000 Enigma machines of various types were manufactured in the 1930s and 1940s, but only a handful have survived. Around 50 Enigma machines of various sorts are currently on display at museums around the world, with many more in the hands of private collectors.